This is a hodge podge of bits and pieces. I bought the peavey generation triple single just before it became unavailable. It’s not bad, not great either. Has a few irritating buzzes, particularly the A-string, I can’t find any neck problems, well no lifting frets or frets too high, so I’m thinking it might be nut related, alhtough that’s a real puzzler. The A-string doesn’t have quite the same sharp angle over the nut like the other strings which are either tree’d or naturally so like the low E. I thought I might get a new set of trees, roller types, and a new bone, tusq or graphtech nut. I could use a string bar to pull the A down a bit. I would like to find out what the pickups are, I’m guessing they are ceramic magnets, and probably not potted, so there’s a few things to play around with there. The Epi valve junior head, is the first valve amp that I have owned. I’m in love!! So responsive and the tone is just …. yummy… words fail me… There are a few mods I’d like to try out, but on the whole I like it’s stripped down simplicity, not too much circuitry to get in the way of the guitars natural sound. When I get around to buying a new set of strings I’m going to let loose my 1984 Washburn Hawk on it… something to look forward to. 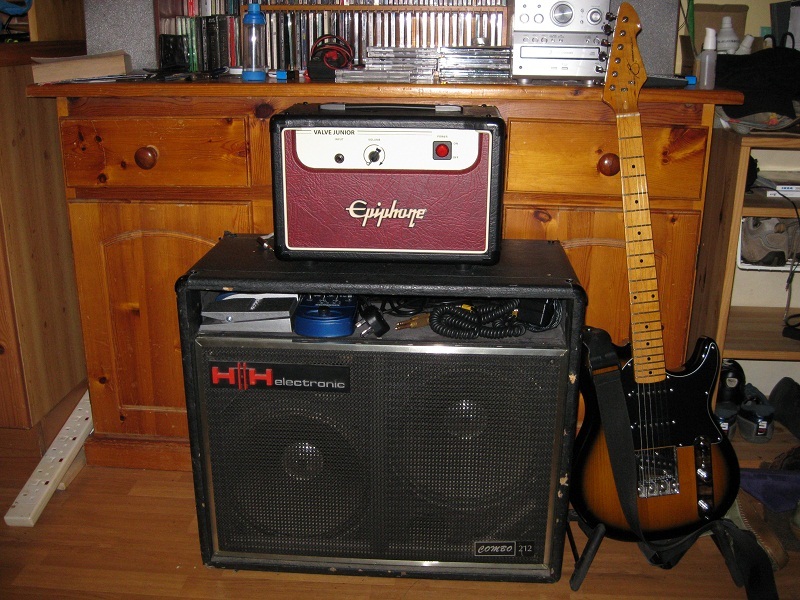 Part of the great sound has to be the 2×12 cab from the old HH IC100 combo. Those speakers are monsters, pretty sure they are 1972 custom celestion G12h-50s although they’re badged HH 12H. They have humungous magnets, and they sound so good in the closed back ported cab. I’ve still got the IC100 amp which just about works, but I can’t get over excited about it. It is quite a museum piece though, so funny to see a board full of 14 pin 741s, I guess the die was as small as it could be back then and needed a 14 pin sized package to fit into. Vintage 741s…. lol that cracks me up! The electroluminescent front is a bit scary though, with it’s 240v ac supply, that must be a right pain in the arse to service.